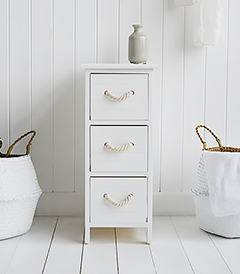 Store your bathroom essentials in our range of white bathroom cabinets to give you a stylish bathroom. White is the traditionally the most popular colour for bathroom cabinets, this is mainly because of the diversity of style that white will complement, everthing from coastal to contemporary interiors, and for the fact that generally bathrooms are the smallest room in your home and white is a reflector of light creating the illusion of greater space. We offer a wide range of styles and sizes to ensure we have a storage cabinet to suit your needs. From slim cabinets to cabinets with drawers or cupboards to store cleaning products, you will find furniture specific to your unique requirements.